By now, I have seen most scarves from this spring/summer collection, and having been torn between a couple of CWs of my favorite (Photo Finish by Dimitri Rybaltchenko), I finally decided on the fresh and light Etoupe/Vert/Marron. Trés joli choix qui se marie si bien avec votre bolide . Trés joli montage aussi du cheval qui finit une course c est genial bravo bravo! Exquisite CW. How beautifully it compliments Le Bolide Bleu. I wish I had the opportunity to purchase those gorgeous RV shoes. They have been so versatile! Alors...my Ortho doc just told me that I won't be out of this cast for another 2 months (from thigh to ankle) I have been wearing my Quicks almost constantly...think I'll give them the heave ho when this is over!! This will suit your complexion very much. I anticipate stylish compositions to follow. May I know which colour lipsticks you are wearing in the last few occasions of blog posts. Thank you, Helen! The lip color is usually a mix of lipliner applied all over, followed by a lipstick. Recently, I've been using rosewood liners (Spice by Mac and 303 Bois rosé by Lancôme) in combination with coral lipsticks (Fashion City by Mac and Rouge in Love by Lancôme). I looked up MAC, sold out :-( . Do you use a MAC blush? It is radiance in your complexion. Awwh, so sorry re the Mac. I also like Sephora's No 27 Rouge Shine, this should be easy to get. Re the blush, I use a mix of colors here too... I sweep a blush brush across two or three different shades (currently apricot, pale pink and rosewood). I have them in magnetic palettes (Bobby Brown, Laura Mercier or Trish McEvoy have excellent ones) which makes this quick and easy. Looks wonderful with your bag and shoes. Clever galloping picture. Enjoy wearing your new scarf. Congratulations, dear MaiTai - such lovely colors, perfect for you! It's been a little difficult to see all the CWs of a particular design this season, they seem to trickle in a little more slowly this year. But I'm glad you found a favorite! Some people have an eye for colour...you are one of them! thank you for your exquisite posts. Vielen Dank, liebe Sanne! Sie haben recht, das Tuch passt wunderbar zum neuen Mantel, und ich hoffe, dass Sie an den Variationen Freude haben werden. Herzliche Frühlingsgrüsse aus dem sonnigen Südfrankreich! Love your new scarf! A perfect choice and a perfect match to Ms Bolide de Prusse and the Belle Viviers. Wear it in good health, my dearest MaiTai! The house facades in Aix-en-Provence are adorable and nobody like you to combine pictures so they make the most beautiful post <3! I love the 'galoping horse'! So cool!!!! I am curious to see how it will look on you ;) The only consolation with this crazy weather is that we can play a little longer with our silk treasures! Have a nice we. Hope you'll like the combinations which will follow :-) The weather here is crazy too.. ranging from 18 to 31 celsius within a couple of days. Let's hope there is a sunny and beautiful weekend ahead! Dear Madame Maitai, congrts on your lovely scarf choice...I think stripes are so classic and those colours match most accessories. Again, please let me paraphrase everyone here: fantastic choice of design (truth be told, it is an amazing design), lovely colours and I can only imagine that they suit you down to a T. Again, and this is what often fascinates me with H silks, they manage to reprise a classic theme (which could easily become boring) like horse riding and manage to exploit it in a, yet again, completely modern, stylish and wearable way! Can we perhaps hope for one of your beautiful action pics? Today, i will be wearing my silk bundled close to my neck as there is so much wind, my carré might be caught like a sail and I WILL fly away! Dear Béatrice, thanks so much for the lovely comment, so happy you like Ms Photo Finish! I too love the design, it has so much energy, and yet it is beautifully calm and chic when tied. Love the image of you being swept up into the air and flying, by your scarf being caught by a breeze..so evocative and poetic... wouldn't this be a perfect scarf commercial! Adore the scarf! It is classic with a slight edge at the same time...typical Hermes. I have become quite taken with your Blog (the word is insufficiently elegant to describe the picturebook, I feel), and being a Francophile, appreciate the glimpses of french life. Do you live near Aix? If so, I am very envious!!! A very warm welcome to my 'Picturebook', dear Nicola! Love the 'edge' of the PF too. We live in the South of France, within a an hour and a half from Aix. Seit ich deinen blog verfolge, liebe ich es sehr, Kleidung mit einem feinen H-tuch aufzu"hübschen"
Danke an dieser Stelle auch für die Hilfe in Sachen Picotin, mal sehen, was daraus wird! Fantastic galloping horse, MaiTai -- that sequence really captures the movement of Photo Finish. Merci! There is so much energy in the design, it's a mesmerizing scarf. 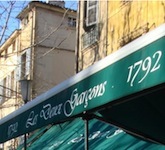 Beautiful shots of Aix-en-Provence, and an even more beautiful selection of scarf. I love this cw. Hope to see some modeling shots soon. Aix en Provence makes me think of Cezanne and all his beautiful landscapes. Love the scarf, love the shoes. Fantastic choice of this seasons Photo Finish and the colours will complament you perfectly. Loved how you made the horse galope great film. Many thanks, dear Jane! Happy you enjoyed the animation, I'm so glad it worked out the way I hoped it would. Your new Photo Finish is stunning with your Bleu de Prusse Bolide, but I am also looking forward to seeing it with your etoupe bags. :-) Such a well thought out, perfect selection (as always), dear. Also, Marseille is not very far from Aix, and has a good Hermès store too. And then there is also Avignon (a small store, but with a good scarf drawer), which can be easily reached by a short train ride. Have fun planning and anticipating your trip! Thanks so much for your advice!!! You are a truly inspiraton!! On July I'll tell you about my final decision. 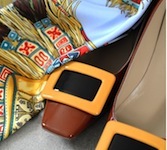 Many thanks, vintagefrenchchic, happy you like the new scarf and combinations!